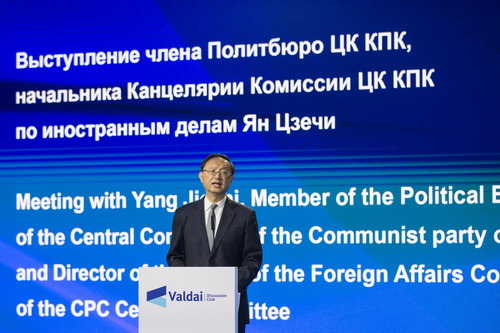 It is my great pleasure to be with you at this year's meeting of the Valdai Discussion Club, which I must say is one of the world's foremost forums. Every year, the Valdai Club brings together the great minds of the world to discuss pressing regional and global issues and explore possible solutions. This year, you have selected the topic "The World We Will Live in: Stability and Development in the 21st Century" for the plenary and "Foreign Policy in Uncertain Times: Pursuing Development in a Changing World" for this session. I am glad to join the other distinguished panelists in discussing these important issues that are highly relevant to our times. Many of us in this room were born in the 20th century, which saw two world wars followed by the Cold War. They have inflicted untold suffering on humanity. In this new century, the world is experiencing yet another round of profound changes and we must make the right choice. We have no reason to allow the tragedies of the last century to repeat themselves. The road ahead may not be smooth, but our commitment to peace and development must be unwavering. First, we live in an increasingly multipolar world. The rise of emerging markets and developing countries is proving to be the primary engine of the global economy and is making the global distribution of power more balanced. This makes it possible for countries to have their voices heard in international decision-making and for the discussion and solution of various transnational issues. Whether some people like it or not, this more equal state of affairs will be here to stay. Second, economic globalization is becoming a fact of life. Economic integration makes countries in the world a community of shared interests. The world economy cannot grow sustainably unless all countries have access to prosperity and development. If you recall, it was by sticking together for win-win solutions that we pulled through the global financial crisis in 2008 and put the world economy back on track toward recovery and growth. Both China and Russia, at that time, did their best and made important contributions to global recovery. It must be remembered that development is a universal aspiration, not a zero-sum game where one nation's gain means another nation's loss. Every nation must pitch in to create and benefit from greater global prosperity. Third, there is a growing call for reform and improvement of the global governance system. The current international order, built on the purposes and principles of the UN Charter, has ensured over seven decades of global peace. The WTO-centered multilateral trading system has fuelled strong global growth for the last 20 years and more. Mechanisms of international cooperation and coordination, most notably the G20 summit, have enabled the recovery and growth of the world economy and the improvement of global governance in the last decade or so. These are important achievements, but much more needs to be done. Many global challenges, from environment degradation to climate change, from terrorism to poverty, cry out to be met. Thus, the reform and improvement of the global governance system requires hard and sustained efforts. Fourth, all members of the international community aspire for peace and security. There is general peace in today's world, major-country relations enjoy stability on the whole, traditional and non-traditional security threats are largely under control. None of these must be taken for granted and must be carefully preserved. Over many years, the UN Security Council has made an irreplaceable contribution to world peace and security. All countries must continue to pursue common, comprehensive, cooperative and sustainable security and work together for a world of universal security and lasting peace. Fifth, dialogue and mutual assimilation between civilizations have become the order of the day. Experience shows that it is possible for different cultures, religions, social systems and values to not just coexist peacefully but also enlighten each other. This will lead to the greater progress of human civilization. First, there are far too many instances of the Cold-War mentality, bullyism, zero-sum game and military coercion. In many cases, there is not enough fairness, equality or justice. Extortion, pressure campaigns and sanctions are still resorted to all too often. Second, unilateralism is gaining ascendancy, putting international rules and mechanisms at risk. Often, countries put too much emphasis on their own power and interests, not enough on meeting their responsibilities. As a result, the trust and cooperation between countries are being undermined by bullying tactics and a beggar-thy-neighbour approach. Third, trade protectionism is running rampant and economic globalization is facing headwinds. No country can escape the challenge presented by a variety of misguided practices in international economic cooperation and multilateral trade. Fourth, many regions are ravaged by instability, conflict and war.Non-traditional security threats, particularly terrorism, are more menacing than before, eroding security in many cases. Fifth, the export of values and development models in disregard of cultural diversity is becoming a source of turbulence in many parts of the world. The talk of"a clash of civilizations" and the self-styled superiority of a certain civilization all cause growing problems for global harmony and peace. The direction of world affairs will hinge on the choices we make. The international community should come together with a strong sense of responsibility to embrace opportunities and meet challenges so as to make the world a more harmonious and better place for all. First, peace and stability is the precondition of prosperity and development. Recognizing this, China will stay committed to its independent foreign policy of peace, the path of peaceful development, and the preference of dialogue over confrontation and partnership over alliance. China will uphold world peace, thus creating the conditions for its development and, at the same time, contribute to world peace through its own development. China sincerely hopes that all countries will likewise choose the path of peaceful development and work together to prevent conflict and war. Second, opening-up is essential to prosperity. An important experience China has gained from its successful modernization endeavor is to promote reform and development through opening-up. Over the past 40 years, reform and opening-up has brought phenomenal progress to Chinese lives and sea change in urban and rural landscape. By opening its door wider, China has shared its development dividends with others and boosted common development across the world. Early next month, we will host the first China International Import Expo in Shanghai. China will not shut its door; its door will open even wider. China will advance Belt and Road international cooperation under the principle of consultation and collaboration for shared benefits, create new vistas in all-round opening-up, and make economic globalization more open, inclusive, balanced and beneficial for all. Third, multilateralism is a basic principle underpinning the global governance system. China will, as always, uphold multilateralism and make active efforts to reform and improve global governance. China will work with others to foster a more fair and equitable international order and global governance system. Fourth, genuine security cannot be achieved unless there is universal security. China will make continued efforts to increase strategic trust among countries. China believes that disputes should be resolved through dialogue and consultation, and common threats need to be countered through international cooperation. We oppose selfish practices in which one seeks absolute security at the expense of others. Fifth, inter-civilization dialogue provides an important underpinning for peaceful co-existence. Respect for cultural diversity is crucial for world peace and harmony. Every country is entitled to choose a development path suited to its reality. When it comes to civilizations, we should uphold the principles of equality, mutual learning, dialogue and inclusiveness, and reject the misguided belief in a so-called "clash of civilizations" or the superiority of one civilization over others. China is committed to building global partnerships, to advancing coordination and cooperation among major countries, to deepening friendship and cooperation with its neighbors, and to strengthening solidarity and cooperation with other developing countries. We call for fostering a framework of major-country relations featuring overall stability and balanced development. China is the largest developing country and the United States the largest developed one.There certainly exist differences and sensitive issues, but the two countries also have extensive common interests and shoulder important responsibilities. Cooperation is the only right choice. It is important that China and the US follow the principles of non-conflict and non-confrontation, mutual respect and win-win cooperation, and work together for the healthy and steady growth of their relationship. This will meet the common interests of the two peoples and the expectations of the international community. It takes the efforts of the entire international community to plan and pursue a bright future for mankind. China is committed to promoting world peace, contributing to global prosperity and upholding the international order. Guided by the overall goal of fostering a new type of international relations and building a community with a shared future for mankind, China will vigorously push forward Belt and Road cooperation, foster global partnerships, expand engagement and cooperation with other countries, and work with all to build an open, inclusive, clean and beautiful world that enjoys lasting peace, universal security and common prosperity. As we embark on this great journey, China sincerely hopes to enhance solidarity and cooperation with all nations. In this regard, China-Russia all-round cooperation sets a fine example for other countries. The past two decades have witnessed rapid growth of China-Russia relations. Under the guidance of President Xi Jinping and President Vladimir Putin, this relationship has delivered high-quality performance in recent years and is at its best in history. Our two countries respect each other's choice of development path and social system; we have scored major achievements in practical cooperation; we maintain close communication and coordination on regional and international affairs; and together, we have played a vital role in safeguarding world peace and stability. China and Russia both advocate a new type of international relations and shoulder the task of promoting peace and development. In a complicated and volatile world, our two countries are determined to further leverage our role as major responsible countries, and make more positive contributions to the world. First, China and Russia need to serve as a bedrock of world peace and stability. Both our countries firmly uphold the international order and system centered around the purposes and principles of the UN Charter. We both support the core role of the UN in international affairs, and uphold multilateralism and a multipolar world. We strive to resolve regional and international hot-spots such as the issue of the Korean Peninsula, Syria and the Iranian nuclear issue by political and diplomatic means. We have maintained close coordination and collaboration on multilateral affairs, and worked to foster a fairer and more equitable international order. As security risks and challenges keep cropping up, China and Russia need to advance international security cooperation, make joint efforts to tackle traditional and non-traditional security threats, combat terrorism, separatism and extremism, and ensure national, regional and global security and stability. Second, China and Russia need to act as an engine of global growth. Our times call for both our two countries to pursue common development through opening-up and cooperation, and to reject unilateralism and trade protectionism. We oppose politicizing economic and trade issues, or willfully initiating a trade war and unilateral sanctions. For China, Russia is a most crucial partner in Belt and Road cooperation. In 2015, President Xi and President Putin signed a Joint Declaration on Cooperation in Aligning the Building of the Silk Road Economic Belt and the Eurasian Economic Union (EEU), which set into motion the cooperation process between these two initiatives. This marks a major step in regional economic integration and contributes to an open world economy. Going forward, China will continue to partner with Russia in advancing regional economic integration and building high-standard economic and trade cooperation mechanisms and arrangements for sustainable economic development in Eurasia. Third, China and Russia need to build a bridge of inter-civilization exchanges and mutual learning. Dialogue among civilizations is an effective way to improve mutual understanding, enhance friendship and address differences. The string of cultural events held in each other's countries in recent years set a good example for exchanges and mutual learning between civilizations and countries. In response to increasingly complicated regional and international challenges in the 21st century, China and Russia need to make continued efforts to advocate respect for cultural diversity and promote inclusive exchanges and mutual learning among civilizations to build a more peaceful and harmonious world. China and Russia are good neighbors, good partners and good friends. In a world fraught with changes and challenges, it is all the more important that we seize the historic opportunities before us and respond to the call of our times by strengthening solidarity and coordination and deepening cooperation in all areas. Let us work together for greater peace, stability, development and prosperity of the world.